← Do Atheists Belong in the Interfaith Tent? Moses’ siblings’ slur is confusing on a number of levels. In the first place, it’s not quite clear who this “Cushite woman” actually is. Cush is commonly understood to refer to ancient Ethiopia (in Genesis 10:6 we read that the Cushites descended from Ham, the son of Noah.) However, Moses’ wife Zipporah is a Midianite, not a Cushite. Commentators have handled this discrepancy in different ways. Some suggest that Zipporah and the Cushite woman are the same person. (Pointing out that Habbakuk 3:7 refers to a Midianite tribe called Cushan). Other Biblical scholars posit that the reference to the Cushite wife is a fragment of a larger literary tradition that has since gone the way of history. These theories are interesting as far as they go, but in the end they fail to address the most troubling dimension to this episode: namely, the patently racist nature of Miriam and Aaron’s words. Classical Jewish commentators famously understand tzara’at to be a physical manifestation of the sin of lashon harah – negative speech, or gossip. For myself, I’ve always found this interpretation to be less compelling as theology (i.e. illness is a result of divine punishment) than as a metaphor for the virulent nature of hate speech. I would prefer to say it this way: Miriam’s malady is not literally caused by her words; rather, her infectious tzara’at mirrors the inner properties of her racist words themselves. Alas, we know this to be all too true: hate speech can be fatally infectious. Left unchecked, racism almost invariably spreads virally through society. Centuries after these Biblical words were written, hateful words continue to mutate into racist attitudes and actions in new and frightening ways. 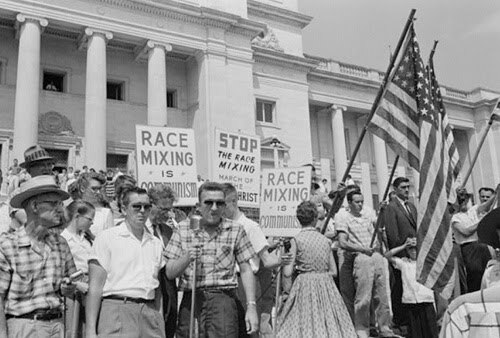 You picked a great photo to illustrate your point, since it demonstrates that “race mixing” was itself thought of as an infection, with racial purity being contaminated by association with outsiders. Sadly, while I’d love to believe the Torah was chastising Miriam for her racism, doesn’t it seem more likely she was being punished simply for going against the chosen leader? After all, G-D showed no racial scruples in exhorting Moses, Samuel etc to wipe out certain races: e.g. the Midianites, Amalekites.